We’ve always stocked equipment for our students to buy, but over the last few years it has become more difficult to sell competitively. For example, we take a branded blowdryer and sell it at pretty close to wholesale cost and then, guess what, it’s on Amazon or eBay for a tenner less! We have to compromise a bit as every student has a different budget and the Team have come to accept that as long as the equipment is of a professional standard then they can use it. We still have to be careful because a number of brands have both a consumer and professional side and of course the consumer side is not meant for use 8 hours a day. But recently, the Team have had to be a little more choosy when it comes to Dummy Heads/Mannequins/Blocks, whatever you call them! 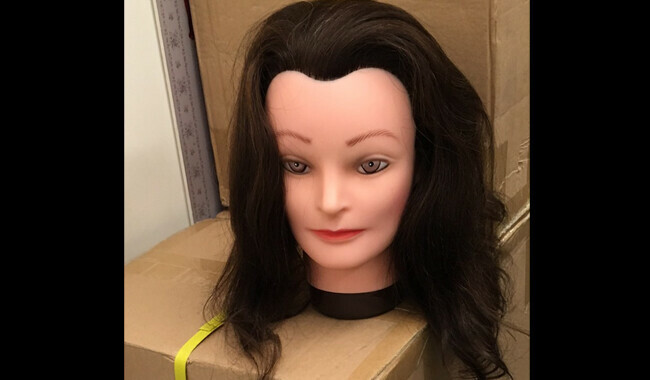 As price is such a factor in purchasing decisions, the quality of the dummy heads being bought elsewhere has dropped to such a poor standard that we’ve had to crack down; unless the student has proof their head is 100% human hair, then they are not allowed to use it. The range of quality is so variable, from 100% nylon that melts as soon as a heated tool goes within 10 feet of it, to those mixtures of human hair and nylon or Yak hair or whatever. As we’ve frequently discovered, they may be cheap but not good enough to practise colouring and perming! We now import our own dummy heads. We choose the hair (100% human of course), the density and even the shade of hair (no. 6 ladies and no. 5 mens) as well as the length of 15-17 inches. Whilst not as long as some, it enables us to keep the cost competitive. The only thing we didn’t waste much time on was the look, but time is money! If you’re looking for a great training head then look no further. Our standard price is £45 inc VAT +p&p, but I’m happy to reduce the cost for multiple orders. Give us a call on 020 7634 9400 if we can be of help.